As with TeamScan and ProScan, you can now search and sort based on several criteria including date, name, email, position, and type of report. 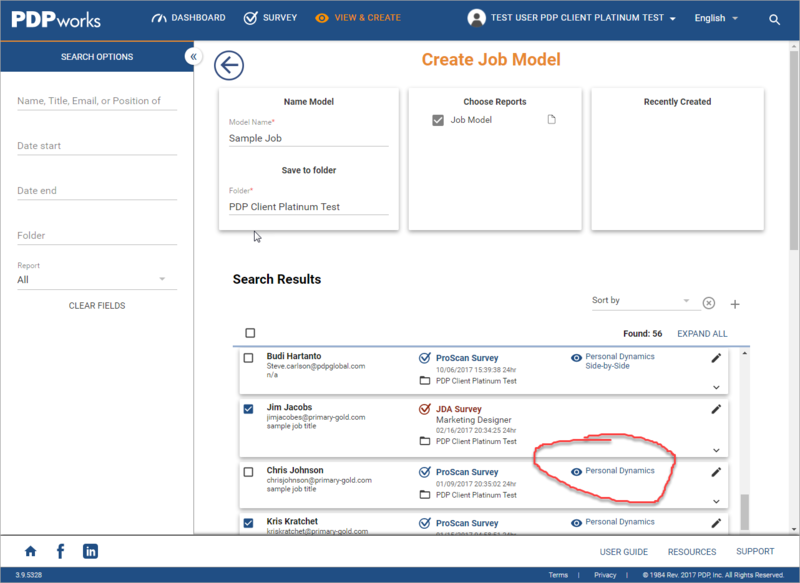 Even better, when you build a Job Model, you have the option to quickly view the reports of high performers before choosing to add them to the Job Model. Once your Job Model is created, you can quickly see who the contributors are by clicking on the down arrow or click "EXPAND ALL" near the upper right side. This will display at a glance the names of all the people whose input make up the report. The Job Model report takes advantage of the new portrait version of the ProScan Intensity Chart and now also provides easy to see color coding for the Contributor Thumbnail Page. Contributor inputs that orginate from ProScan reports are in blue while the Job Dynamics Analysis Surveys are in red.